Calvin Barkdull had graduated from the University of California in 1894. He worked here as Chilkoot packer but left by 1902 and went to Petersburg to raise foxes, work a gold mine and a hotel. Adele divorced him and remarried a Mr. Clarence McBurney by 1900. 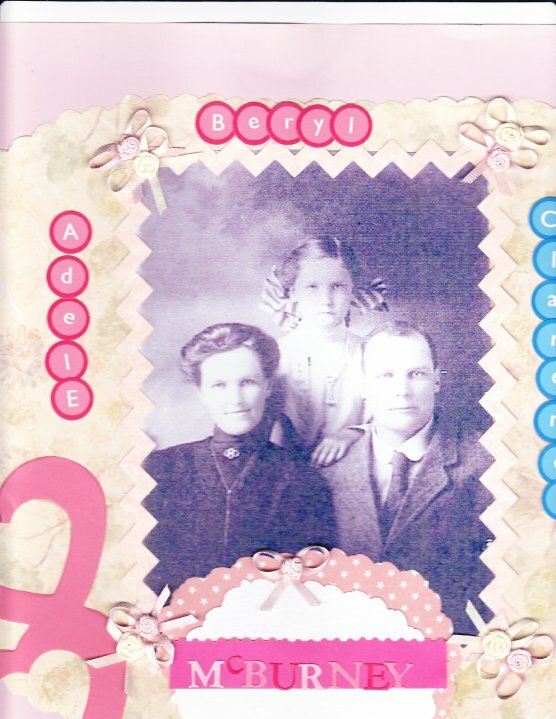 Here is a photo donated by Judith Bacon of Adele, her daughter Beryl and her 2nd husband Clarence McBurney from around 1905? On this day, January 22, 1898 the Reverend Doctor Grant arrived in Skagway. He came here from Almonte, Ontario, but was referred to as a “Scotchman” by Mills. Andrew was born in La Guerre, Quebec, Canada on October 10, 1860 and for 3 years went to McGill University to study medicine. Rev. Grant left Vancouver for the Klondike on S.S. Danube at age 38. He was a Presbyterian minister and went on to help build the church at Lake Bennett. Together with the Rev. G. Bowen (Anglican) and Rev. S. Hall, they also built the Good Samaritan Hospital. 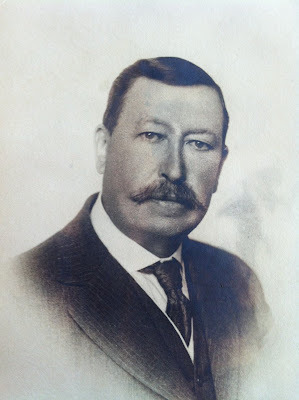 In 1900 he returned to Toronto and brought his family to Dawson where they lived from 1902-1908. Happy Birthday to Colonel Anderson born on January 21, 1836 in Chillicoth, Ohio. He came to Skagway in December 1897 with the 14th Infantry. 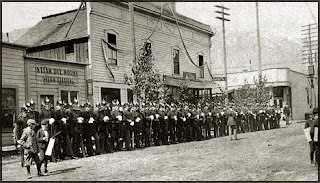 Above, soldiers of the 14th Infantry parade in their superb dress helmets in downtown Skagway, Alaska, 1898. They were posted to Skagway at the request of Alaska’s territorial governor, John Brady, to protect Skagway from hordes of “gamblers, thugs and lewd women” – no doubt the sight of the serried ranks of pickelhaubes helped bring the gamblers, thugs, and those lewd women back to a sense of civic responsibility. Anderson was the commander of companies B & H. He had a long military career and died a Brigadier General in 1917 in Portland, Oregon and is buried in Arlington. Martin Conway was born in 1861 in Ireland but came to Skagway in the goldrush. He stayed for 30 years until his death here on January 18, 1930. During the time Conway lived in Skagway he was a merchant in 1905-the manager of B.M. Behrends dry goods; then United States Commissioner and Judge from 1908 to 1915; treasurer & Magistrate of Skagway in 1915; and finally the Postmaster from 1916 to 1930. Martin’s wife was Rachel Quinlan born in Saint John, NB Canada and worked for White Pass at Bennett and Carcross. His daughter Elizabeth and sons John (Jack) and Martin Jr. were born in Skagway between 1903-1907. John succeeded Martin as Postmaster of Skagway in 1930 when Martin died. 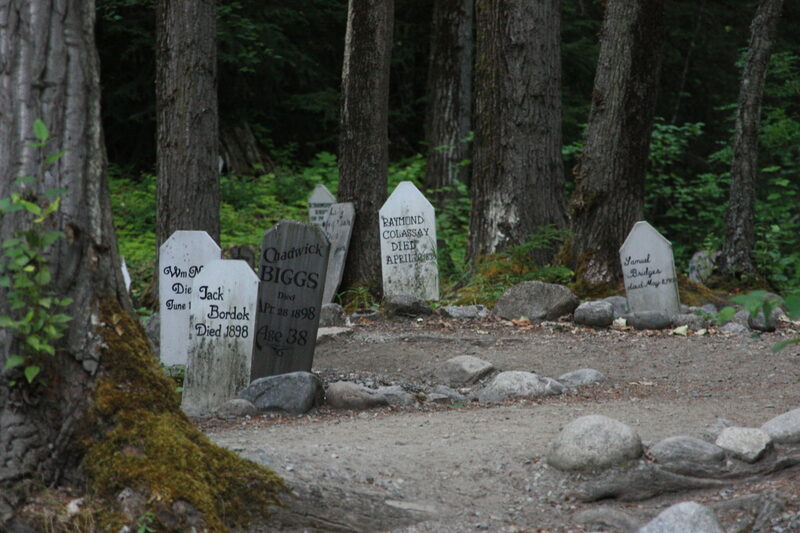 Martin Conway is buried in the Skagway Pioneer Cemetery. The photo above is of Martin, it was shared by his descendent. The Rev. Sinclair was the Presbyterian missionary who is quite famous in the North. He was the person who buried Soapy Smith and later built the famous church at Lake Bennett where he stayed until April 1900 when he went to Eldorado and Creeks. Born on February 27, 1864 in Scotch Corners Ontario, he married in 1895 and was in Skagway for the famous 4th of July 1898 parade. 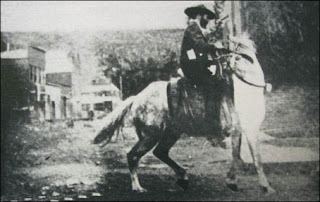 He took the photo above, and wrote in his diary that he snapped the shutter at 9:00 am on July 7, 1898 a mere 36 hours before Soapy was shot dead, which makes this the last photograph taken of Soapy while he was alive. Rev. John Sinclair died too young, on this day, January 15, 1904 of an appendectomy. He wrote a book called “Mission: Klondike” which is available for sale online. Happy Birthday to George born January 13, 1873 in California, maybe Albany where he had relatives when he registered for the World War One draft. He was a painter and a paperhanger here in Skagway in the 1920’s, and in 1920 he was living at the Golden North Hotel. He died here in 1925, possibly in the Golden North (ghosts anyone?) and is buried in the Pioneer Cemetery. The picture above is the memorial that used to be at Inspiration Point along the train tracks, dedicated to the pack horses on the trail of ’98. The picture was taken in 1967, I’m not sure if the marker is still there or not. Henry was born on this day, January 12, 1867 in Kingston-upon-Hull England. He was the first born into a prosperous family. He attended Felsted School in Essex, and entered the British Colonial Civil Service, with his first appointment in Malaya. While in Malaya, he married Anne Rose Hewitt. A subsequent personal scandal and divorce resulted in Hulbert leaving Malaysia and arriving in the United States. Like so many others, he came to Skagway in 1897 and called himself a miner. Soon after, at age 31, he enlisted in the United States Marine Corps on March 28, 1898. He completed his boot camp training at Mare Island, California. On April 1, 1899, Marines from the U.S.S. Philadelphia went ashore at Samoa in the Philippine Islands, with Royal Marines from two British ships, to intervene in a dispute between two tribal leaders over succession to the Samoan throne. The Marines were ambushed, and Private Henry Hulbert was one of three Marines and one Navy Gunner’s Mate to earn Medals of Honor for their heroism in the engagement precipitating withdrawal of the unit. Private Hulbert was cited for “distinguished conduct in the presence of the enemy”. Subsequently in World War One, he distinguished himself at the Battle of Belleau Wood, Soisson and the Battle of Blanc Mont Ridge,where he was killed in action on October 4, 1918 at the age of 51. He was posthumously awarded the Navy Cross. Captain Hulbert is buried in Arlington Cemetery. The U.S. Navy destroyer USS Henry L. Hulbert (DD-342), named in his honor, was christened on June 28, 1919, and commissioned and put into service in 1920. The destroyer was moored in Pearl Harbor on December 7, 1941 and brought down a Japanese torpedo bomber. The Hulbert was decommissioned in 1945. 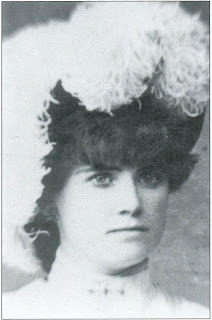 Nellie Cashman came to the Klondike about 1898. She was a native of County Cork, Ireland and had worked as both a nurse and a grocer. She was known as the “Angel of the Cassiar” because of her tireless work with the sick men. She was also known as the Frontier Angel, Saint of the Sourdoughs, Miner’s Angel, and The Angel of Tombstone. Her energy and selfless work is an inspiration. She died in Victoria on this day, January 4, 1925 at the age of 80 in the hospital there that she helped to build. She is buried in the Ross Bay Cemetery near all the Religious nuns and priests. I visited her grave in November. The cemetery is beautiful with a view of Ross Bay, a short walk from downtown through some very pretty neighborhoods.